What The Heck is SPF-100 & Is It Effective? What The Heck Is SPF 100? And Is It Effective? Seven Seas wants you to stay protected at the pool this summer, without being fooled by misleading labels. So, we’d like to wipe the stinging sunscreen from your eyes and reveal the truth behind sunscreen SPFs. Not a good analogy? Well, we’re here to help clarify your sunscreen misconceptions. Before we delve into the legitimacy of SPF levels, let’s clarify what SPF actually is. SPF, short for sun protection factor, measures how effectively a sunblock protects your skin from the sun’s shorter-wave ultraviolet B rays (UVB radiation), which can cause sunburn. The max level of SPF used to be 30 but in recent years sunscreen companies have started offering sunblocks with SPFs of up to 100+ in both lotion and spray form. So how effective are they? Sunscreens boasting high SPFs offer only slightly better protection against UVB rays than sunscreens with SPF 30. Additionally, higher SPFs still do not always protect against Ultraviolet A radiation (UVA rays), also known as the “aging” rays. According to The New York Times, sunscreens with an SPF of 100+ block 99 percent of UVB rays while sunscreens with SPF 50 block 98 percent. Although no sunscreen is currently capable of blocking 100 percent of the sun’s rays, the difference between sunscreens with SPFs of 50 and those touting SPFs of 100+ are minimal. 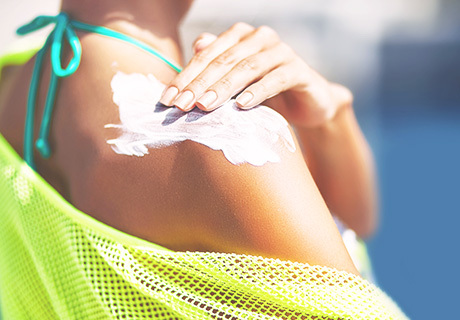 There may not be a significant difference between sunscreens with SPF 50 and those claiming 100+ but the importance of protecting your skin remains the same. The following steps can help keep your skin healthy. How frequently you should reapply your sunscreen is determined by multiplying the SPF you’ve purchased (which we now know is all really a maximum of 50) by the amount of time it takes for your skin to burn without sunscreen. For example, if you have purchased a sunscreen with an SPF of 15 and it usually take you 15 minutes to burn without sunblock, you should reapply every 225 minutes or, every three hours and 45 minutes. However, this is just an estimate and most dermatologists suggest reapplying every two hours. Both UVA and UVB rays can lead to cancer, which is why it is important to ensure that your sunscreen protects you from both radiations. Only sunscreens labeled “broad spectrum” actually protect from both UVA and UVB radiations. Additionally, many sunscreens rub off with sweat or can be washed away by water. Do not be fooled by labels that say “water resistant.” Water resistant sunscreens are not waterproof or sweatproof and should be reapplied more frequently to avoid burning after the lotion rubs off. According to CNN, anytime you’re planning to be outdoors, you should apply a minimum of one ounce (a shot glass full) of sunscreen to your body and at least one generous teaspoon to your face, every two hours. Whether you’re playing with the kids in the yard, hiking outdoors, or just relaxing by the pool, it is imperative that you protect yourself from the sun’s rays. So, grab the closest bottle of sunblock and enjoy the summer knowing that your skin is protected.